These compressed skin care treatments are the clear answer to skin care maintenance when you are short on time and yes, even budget. What’s more, our unique skin bar format means we can customize and adapt your treatment on the fly. A touch of fairy dust (or mineral powder) before you go, we send you back to the office glowing and flawless! 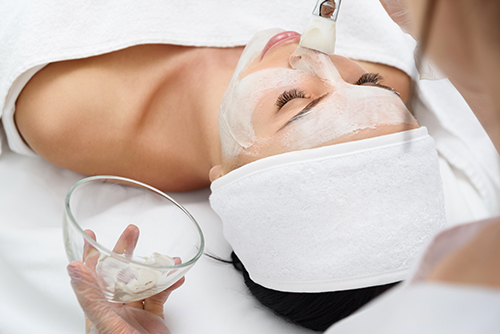 Using advanced exfoliating options and nourishing hydrating products we provide you with a fully customized facial specifically tailored to your skin type. We like to think of it as a treatment that has all the core elements you need without the fluff! Whether soothing and calming or active and exfoliating we have you in and out in 30 minutes, taking care of every little aspect. Starting with cleansing (don’t worry we won’t mess up your eye makeup! ), we take you through the appropriate exfoliation for your skin and address your key concerns. We can even match and finish you with our Jane Iredale Mineral powder before you go back to the office. We LOVE the Dermalogica skin care line. Boost your skin and keep it vital and refreshed with the perfect skin care solution for us busy ladies (and gents) on the go. We take the Dermalogica Microzone™ Treatment as our base and take it up a notch. Treatment that includes 4 progressive steps that cleanse, hydrate, revitalize and firm. Perfect before a special event, wedding or public appearance. Recommended for Dry, Dull and loss of firmness. 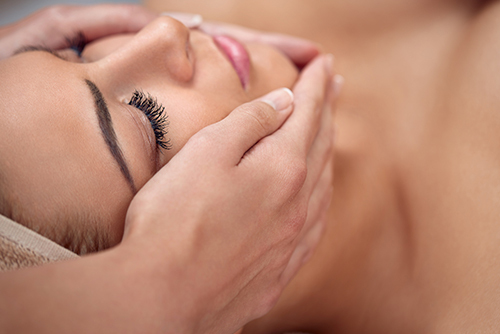 Treatment is designed the clear skin, revitalize fatigued, stressed and dull skin. Specifically recommended for oily, acne-prone skin. Includes Extractions. A highly respected and sought after age defying skin renewing treatment. Improves overall complexion, minimizing appearance of fine lines and wrinkles. Restores moisture leaving the skin hydrated and radiant. Recommended for age correction. A powerful age-defying skin care designed to delay the visible signs of aging, and energizes skin. Treatment is exceptional for both pre and post-sun exposure. Ideal for those who live in urban areas with high pollution levels. Recommended for Age Defence. And just to relax; awaken your senses with the aromas of Yonka Phyto-Botanical products. Refreshing and revitalizing, this treatment will leave you glowing. A deep exfoliating treatment that combines lactic and glycolic acid with Arginine to promote hydration. Recommended for aging and congested skin types. Designed for Deep exfoliation that works to even out the top layers of the skin. Recommended for aging and texturized skin. Designed to exfoliated, deep cleanse pores and eliminate the visible imperfections on the skin. Recommended for oily, acne-prone and hyper-pigmentation. Don’t forget that like everything we do, we will select the right treatment and customize our approach and application, accordingly to your skin and needs. We begin with micro-zone treatments such as Flash Exfoliation, Age Repair, Skin Soothing, Moisture Boost, and Oil Control, but customize them for your unique needs taking them to the next level. Our favourite exfoliator by far! Loaded with vitamins, this mask feels lovely and is awesome for when you’ve been in the sun too long.